The restaurant is in a small, modern building and is very clean, nicely appointed with attractive furniture, and very spacious, seating about 80 people or so. Some framed articles in the foyer memorialize a couple of favorable reviews from the past. When I arrived at 6pm, there were 12 other patrons present. Mukut seems to be a family business and I was served by a man and woman who I took to be husband and wife. There were also two children evident but they were quiet and more or less blended into the background. The service throughout the meal was both friendly and courteous and I found the male server to be quite knowledgeable about the items on the menu and more than happy to chat about them. I think the pair were both striving to be efficient but I was a bit amused to note that there was something of a disconnect in their activity as one would occasionally come to see what I wished to select next only seconds after the other had just taken an order. 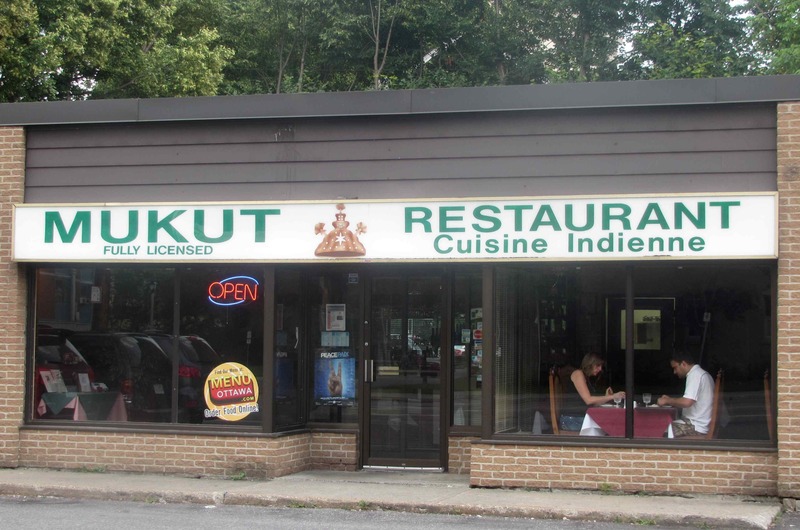 The menu at Mukut is fairly extensive and generally representative of Indian restaurants that don’t specialize in any particular regional cuisine. The prices for the various dishes, I was pleasantly pleased to note, are so low as to be remarkable. After ordering a beer (they have two Indian types available), I was served with a complimentary poppadum, which, in this case, was made with whole cumin. This is very common in Indian restaurants but, somewhat unusually, there was no chutney or other dipping accompaniment provided. I didn’t care about this actually, but I am not sure if this is standard here, or whether it was just overlooked. 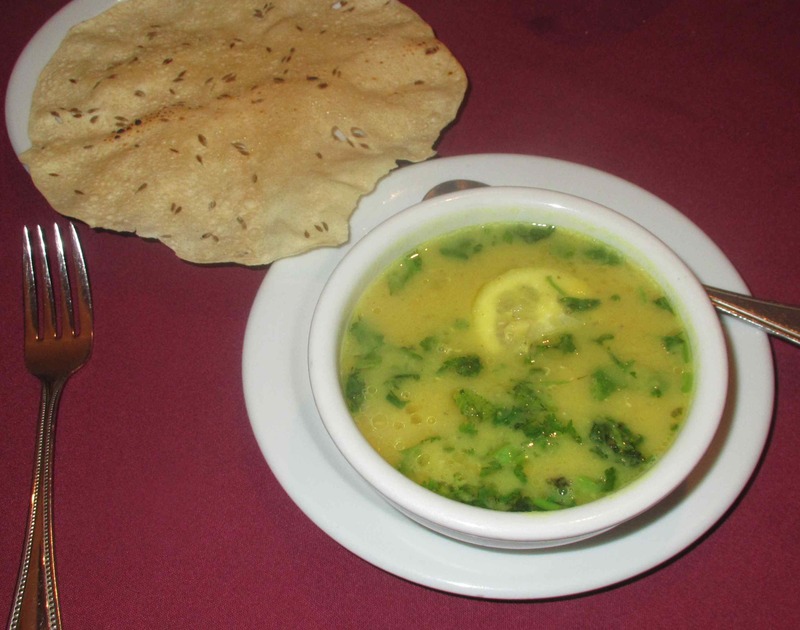 Dal Soup – This dish, I have to say was very disappointing. The only discernible flavor over the plain lentils was the coriander and the lemon used as garnish. I was expecting something a little bit spicier and the result here was extremely bland and uninteresting. Rating: 2 out of 5. Onion Bhaji – This appetizer consisted of a small amount of finely minced onion in a batter composed, I think, of besan flour. Unlike the preceding dal soup, this was fairly nicely and evenly spiced. 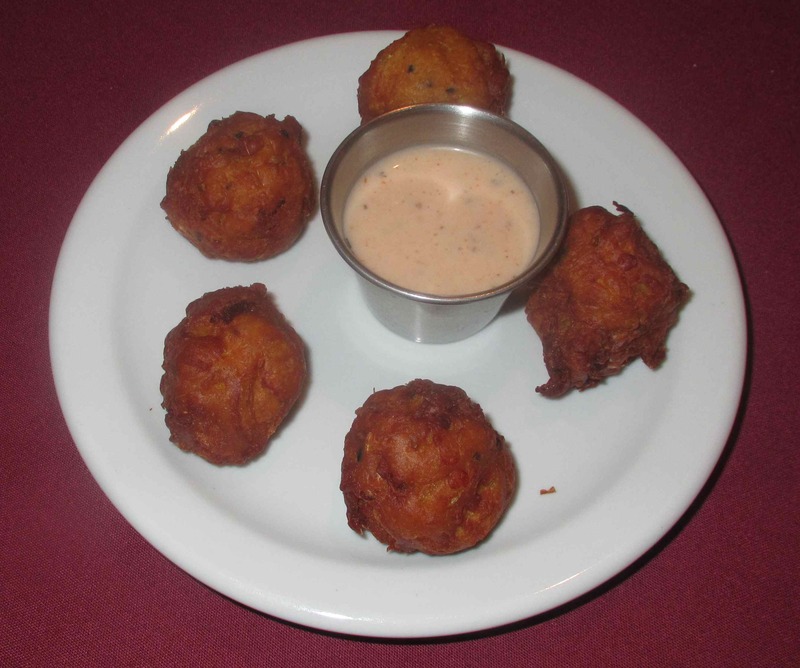 I can’t really identify the components but I did see whole fennel seed and kalonji in the batter and, while there was a little bit of heat to the mix, I rather think this was from pepper rather than chili. The dipping sauce was composed, so I was told, of yoghurt, mayonnaise, mint and various spices, and it was a nice complement. In all, I have had better Bhaji in other restaurants but these were, I have to confess, still better than any I have made at home and I will have to try and replicate them sometime. Rating: 4 out of 5. ChickenTikka – This was advertised as skewered chunks of chicken grilled in a tandoor. It was an appetizer portion and the meat came served with a light salad. In the first place, It is difficult to believe that the chicken ever saw the inside of a proper tandoor me as it struck me as having been steamed rather than grilled or roasted. It was bland, lacking any nice caramelization from a high heat sear, and the bare dusting of a very generic tandoori spice blend was so light as to be almost imperceptible. 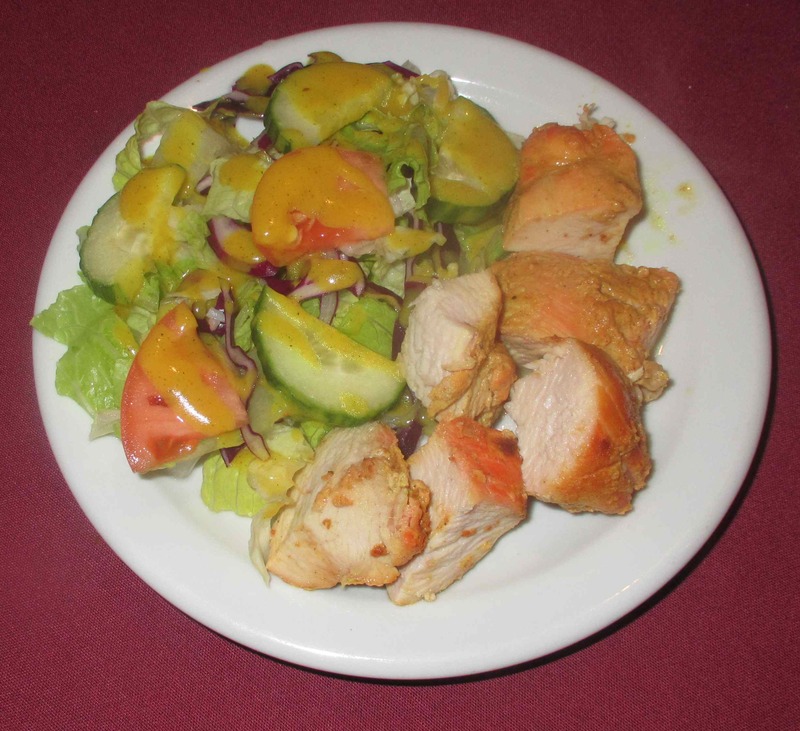 To compound things, the sauce on the salad was a rather sweet and insipid, vaguely curry-tasting concoction and would, I think, have been more at home in a microwaveable Japanese Ramen noodle package rather than an Indian restaurant. This offering was a definite fail. Rating: 1 out of 5. It is a real shame that the owners of this place appear to have made the regrettable business decision to ‘dumb-down’ their Indian food to appeal to western tastes as it is a very nice restaurant otherwise. 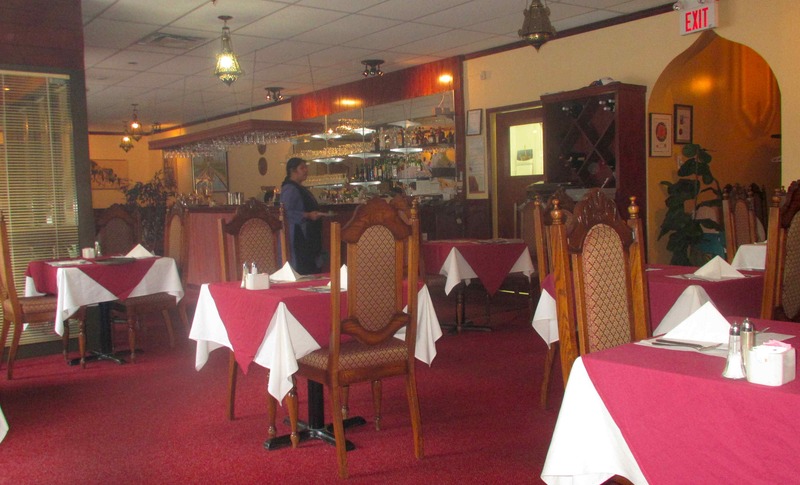 For novices seeking to try out the flavors of India for the very first time, I suppose you could do worse than here (especially given the prices), but for aficionados of Indian cuisine, the place will probably be a disappointment. If the management were to reassess their menu and go ‘back to their roots’, as it were, they could probably command more expensive prices and build up a nice appreciative clientele as everything else about the place was great. Rating: 2 out of 5. Does not look very appetizing. Were there a lot of other diners? About 12 when I arrived but not many more came. The place seems to be popular according to local reviews though. That is way more than I expected! The interior of the restaurant looks nice, but the food looks really not authentic at all. It does not look like proper Indian food.